What is the Axcient Business Availability Portal? The Axcient Business Availability Portal serves as a single pane of glass for everything related to Axcient products and services. This article will answer some frequently asked questions about what the Portal can do and how you can use the Portal most efficiently. What will the Axcient Business Availability Portal ultimately provide for partners? What can I do on the Axcient Business Availability Portal today? Get alerted on special events, upcoming training sessions, and new releases. You can also explore additional Axcient suite products here which you may not have currently activated. 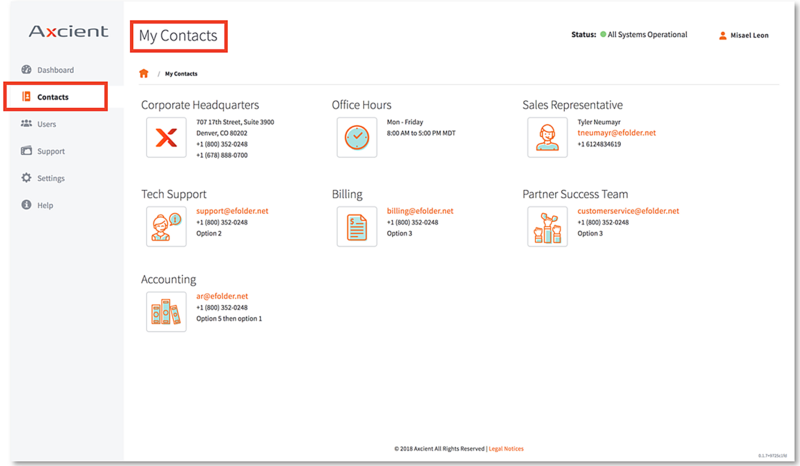 The Contacts page is where you’ll find connections to your Axcient representative and your Partner Success Team, as well as links to the Billing department and Tech Support, all in one place. The Users page is where you add your employees to your organization. You can manage which employees have access, and set up their permission roles. The Support page is where you will submit, view and track the status of your Support requests. You can see the ticket ID#, the product involved, the creation date and the status of all of your Support requests on this page, among other details. The Settings page provides two options: You can edit your account settings, including email and passwords, and you can also select which of our newsletters you would like to subscribe to. Have more questions about the Axcient Business Availability Portal? Please contact your Account Representative or the Support Team.